Who was Thomas Kirk's father? A burned county courthouse, destroyed census enumerations, and lost family lore have complicated the question. Understandably, all research options are on the table as I try to uncover my fifth great-grandfather's ancestral origins. Born in 1778 in - most likely - Virginia, Thomas settled in Licking County, Ohio where he died in 1846. Most genealogies conclude that Thomas married Sarah Louise Bonar in about 1804. Together they had at least twelve children of whom ten survived to adulthood. The eldest child was their son Vachel (my fourth great-grandfather) who was born in approximately 1805. What can Vachel Kirk tell me about his paternal grandfather? If the Kirk family followed traditional Scottish or even Irish naming patterns, the first son was named after the father's father. Was Thomas a man of tradition? Did he name his son Vachel after his own father? A clue to Thomas' inclinations can be found by using his eldest daughter Jane Kirk as an example. Naming customs typically stipulated that the eldest daughter be named after the mother's mother. We know that Sarah (Bonar) Kirk's mother's name was Jane (McCulloch) Bonar. It seems - at least in the case of his daughter - Thomas did stick to tradition. Vachel certainly was an unusual name. How many could be out there? Surely I could locate them all and quickly discern whether there was any family connection to my Thomas. Broad name research is complicated in the early 19th century census records. Only heads of household were enumerated before 1850, eliminating any Vachels who were still living with their parents. Also, many states' census records were lost, including Virginia's 1790 enumeration (this is of particular concern since some of Thomas' children indicated on later censuses that he was born in Virginia). Ultimately, I found two other Vachel Kirks, both in Ohio, who were near contemporaries of my Thomas Kirk, although not old enough to be his father. Given the shared unusual name and location, they required further scrutiny. 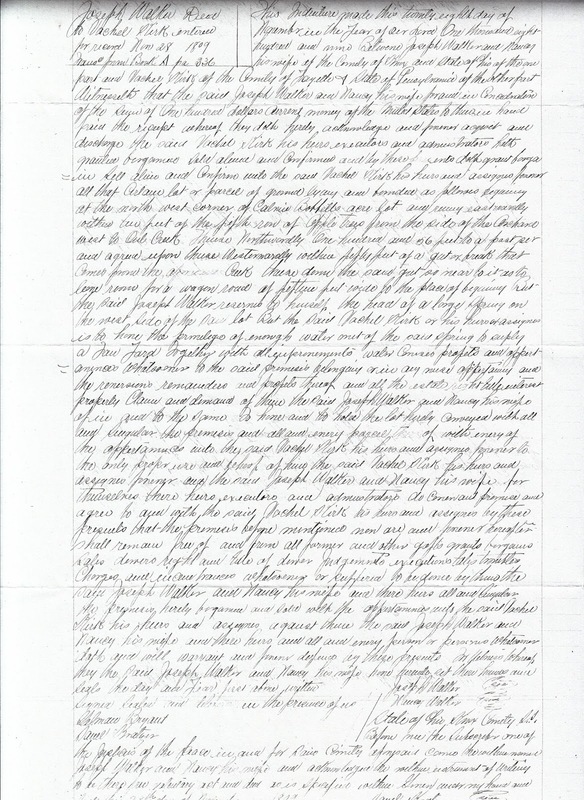 land in Knox Co, OH in November 1809. Vachel Kirk #1 was born in June 1783 in Pennsylvania and died April 6, 1836 in Butler County, Ohio. His death and approximate birth dates come from his headstone. His birth location was reported by his daughter Nancy on the 1880 census. This Vachel Kirk would have been five years younger than my Thomas Kirk. Obviously this wasn't a father son relationship. However, it's possible that they were siblings or cousins. A Vachel Kirk was enumerated in Fayette County, Pennsylvania in the 1810 census. The eldest male enumerated in that census was between the ages of 26 and 44. If Vachel was born in 1783 he would have been 27 in 1810 and would have fit this broad age range. In November 1809, a Vachel Kirk from Fayette County, Pennsylvania bought land in Knox County, Ohio for $100. Knox County borders Licking County to the south. This land purchase put Vachel Kirk #1 within proximity of my Thomas Kirk. Vachel Kirk #2 is a murkier fellow. He was perhaps born in the late 1790s or early 1800s in Virginia or Ohio. There were minor discrepancies between the census records. The one common fact that helped pinpoint him was his spouse, Susanna Allstaff, and children. 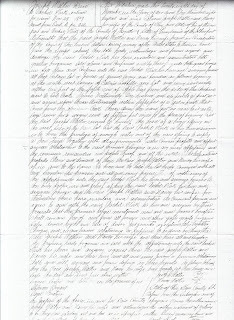 This Vachel Kirk married Susanna Allstaff on December 1, 1825 in Belmont County, Ohio. To-date, his last documented appearance that I've uncovered was in the 1870 census. He was living with his wife and daughter Sarah in Clay Township, Hendricks County, Indiana. I haven't discovered a grave or other evidence of when or where he died. When the paper trail doesn't cooperate, I advocate turning to the genetic code. Underscoring the value of investigating people of shared unusual family names, I've just identified a genetic link between descendants of Thomas Kirk and both of the above-mentioned Vachel Kirks. However, I still haven't determined our shared common ancestor. I mapped out a direct male descendant of Vachel Kirk #1. He agreed to take a Y-DNA test. The results - at 37 markers - came back as a match with a genetic distance of two. Family Tree DNA estimates that, at this level, there's more than an 88% chance that we share a common ancestor within the past eight generations. 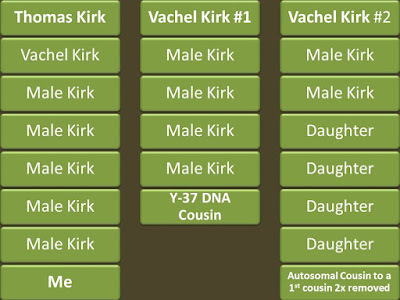 If Vachel #1 was a sibling to my Thomas Kirk, that means the common ancestor - their father - would be eight generations ago. I'm hopeful we can upgrade this Y-DNA test to include more markers and yield more refined estimates. Meanwhile, from a different lab, a first cousin twice removed on my Kirk line recently had a new 5th to 8th cousin match appear on Ancestry. This matching cousin is a descendant of (drum roll please...) Vachel Kirk #2. This match estimate suggests that their shared ancestor was in the range of a 4th to 7th great-grandparent. In their case, the fourth great-grandparent level begins with Thomas Kirk's parents. 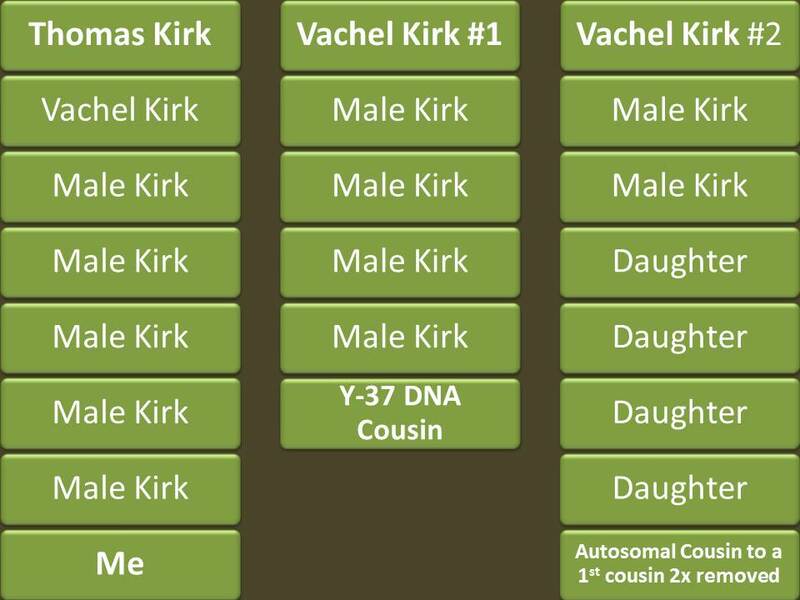 It seems highly unlikely that Thomas Kirk's parents would have named two sons Vachel Kirk who both lived to adulthood, so I currently hypothesize - based largely on birth year - that one of them was a sibling to Thomas (Vachel #1) and the other was a cousin or nephew (Vachel #2). Of course, there's much more research required to confirm these theories. I'm excited to identify new Kirk family members who were contemporaries to my Thomas Kirk. It creates new research avenues to pursue. If the records are snuffed out on Thomas' line, perhaps results for the two Vachel Kirks will help shed light on our shared paternal ancestral origins. Wow! How DNA has changed genealogy research! It really is a game changer. And I'm glad for it!